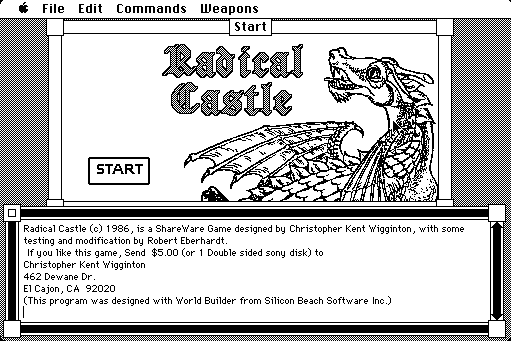 Radical Castle is a 1986 World Builder adventure classic designed by Christopher Kent Wigginton, which was originally distributed as shareware on multiple cover disks. I first came across Radical Castle around 1988. As a kid I would wait around in mumʼs office fiddling with her Mac Plus. The office had an intranet that I used to search for shareware/freeware apps. When mum returned to her office she was often surprised to see little gadgets on her computer, such as eyes that followed the mouse and Oscar the Grouch in the trash. Radical Castle fit in well with these gadgets. You play the role of a squire who has fallen out with the king over a secret meeting you had with the princess. Although you are repentant and honestly thought that the princess was a serving wench, the king still isnʼt happy. He gives you a choice between death and a long quest to find an oracle that an evil wizard has stolen. Radical Castle has an immediately familiar feel if you have played any other World Builder (WB) games. 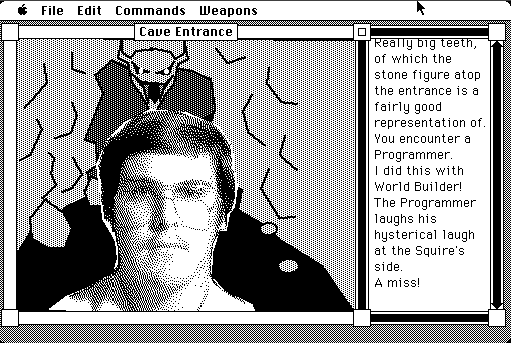 WB was a really cool engine that allowed people to easily script games like Radical Castle. I still use it to read through the scripts of some more complex WB games when I get completely lost. Often the wording for actions in WB is strange, so while Iʼll know what to do, I wonʼt have the right phrase. Also, Iʼm an Aussie, so as a young lad I was often confused when actions required American spelling. That said; WB and Kingʼs Quest taught me how to spell! I was a decent speller all through my schooling, and have retro games to thank for this. The graphics are all black and white, but have some majesty about them. 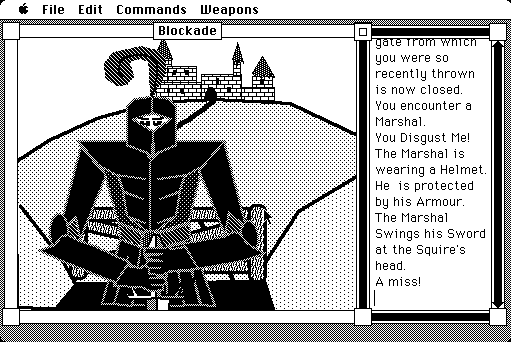 Theyʼre all hand drawn, possibly in MacPaint, and have a surprising amount of character/detail. I particularly like the scene where you walk into a large, magical story book. The oracle is cool too, but youʼll have to play the game through to see it. Surprisingly, the sounds from this game pop up everywhere in life! Iʼm not sure where Wiggington got them from, but having played the game I often find myself saying “hey thatʼs the sound from Radical Castle!” Maybe itʼs a set of stock sounds or something? It's kinda neat that many of the sounds are still used today, regardless. While I wouldnʼt say that the story has much depth (itʼs actually really short), itʼs cute and funny. As a kid I always took it really seriously because the idea of a quest was very appealing to me. That said, this quest has an element of Monty Python. The bad guys all have their quirks, and thereʼs point-and-click easter eggs everywhere. Outside the story thereʼs lots of fun, and I often enjoy looking for new easter eggs throughout the world. I suggest ignoring the direct story, and spending more time fiddling around in order to enjoy the game the most. Overall, this game is one of my favourites. I donʼt think it will ever go down as one of the all-time greats, but for its cute graphics, memorable sounds, and silly story, I think it deserves a special mention as a fun game that is worth playing even today. As I initially played the game on a Mac Plus, itʼs very appropriate to use Mini vMac to emulate it, as vMac is a Mac Plus emulator. Why is Mini vMac “mini”? Because itʼs all written in assembly, so you can emulate a whole computer in an app thatʼs less than 100k -- pretty cool. 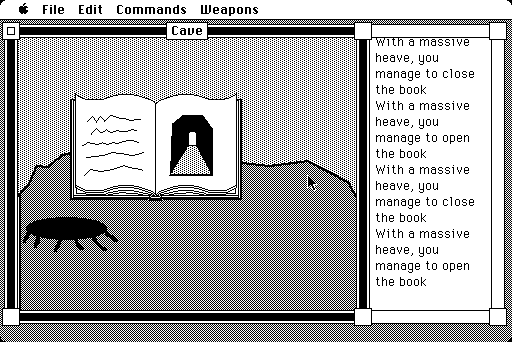 All youʼll need is a copy of Mini vMac, a Mac Plus ROM (Dogpile “vMac.ROM,” just to be different), a copy of MacOS 6.x.x and a copy of Radical Castle. Since 10.6 removed write support for HFS (standard) disks, I suggest simply booting off your system disk then inserting and playing off your Radical Castle disk if you just want to play Radical Castle. This is because the lack of write support makes setting up a hard disk a little fiddly. Possible and useful if you plan to play lots of early Mac games... but fiddly. While I donʼt have the programming expertise, if somebody does, it would be great to see an OS X-based WB interpreter one day. The WB pseudo language is viewable by downloading a copy of WB and simply opening up the files from old WB games. ResEdit can probably dig up a few more fragments, so who knows -- maybe somebody with a bit of talent could build one if theyʼre looking for a project. Have you played any of the World Builder games? Which is your favourite, and what do you think of the interface? Did you ever finish Radical Castle? Tell us your thoughts in the comments below. If you are interested in writing or contributing to a future Retro Game of the Week, please see here, or declare you interest on the forums. If you would like to suggest a game for discussion, please post to this forum thread. You can see all previously published entries, and any confirmed as upcoming, by looking at this thread.